At Wespray on Paving, we specialise in commercial decorative, slip-reducing spray on surfaces. Unlike traditional paving methods, spray on paving is quick to apply and can be used to rejuvenate tired, concrete surfaces. Spray on paving is a method of applying a decorative coating or finish to regular concrete surfaces, replicating the appearance of traditional paving techniques. This type of paving can be applied on both new and old concrete surfaces and is usually used for footpaths, driveways and roads. What are the Benefits of Spray on Paving? Our spray on paving uses a fungicidal additive that inhibits the growth of mould, moss or lichen, which reduces the surface’s maintenance needs. The UV-resistant sealant we use ensures the colour of the paving and any patterns it contains look like new for years to come. The sealant also makes cleaning the surface a lot easier. Spray on paving is available in a range of different colours, with varying textures and patterns, which are designed to meet the needs of your project. Special markings or company logos/insignias can be embedded in the surface, which is a big plus for some of our commercial and government clients. All of our spray on surfaces come with a full five-year warranty, as your decorative concrete surface will be durable and long-lasting. Our paving is pendulum-tested and complies with AS 4586 standards. Spray on paving has become a popular choice for government infrastructure projects, with our surfaces being deemed one of the safest options available for footpaths and roads that get a lot of foot traffic and are exposed to a number of conditions that would usually initiate wear and tear. We’ve also been getting more property managers seek our services, as our slip-resistant finishes can help reduce the proliferation of slip and fall injury claims in shared residential spaces and also publicly accessible areas. Where can Spray on Paving be Applied? As discussed in our previous blog, ‘How Versatile is Decorative Cement Resurfacing?’, spray on paving can be used in a number of applications. 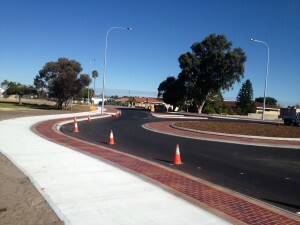 We have completed commercial projects for schools, fire stations and local government authorities, with our paving appearing on roads, footpaths and driveways across Western Australia. 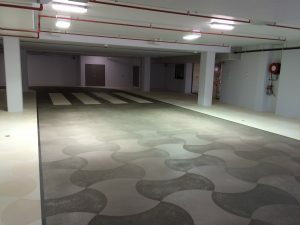 To learn more about our commercial decorative concrete resurfacing services in Perth, contact the team at Wespray on Paving today!